Just a little introduction about me, I live in central Maryland not too far from the Pennsylvania line with my hubby, son and a Golden Retriever. Some fellow contributors may already know me thru my blog but, I see a few new names. The new reason for my introduction. I work full time and love to go bird watching on the weekends and on my vacations. I am animal lover and I enjoy nature and the great outdoors. I have been birding for years now and I am a member of the local bird club. I have been blogging just for fun for 5years I started blogging on July 13, 2013. I admit I am a total amateur at photography, I just like taking photos of all the birds that I see and to record my lifers. The Rose-Breasted Grosbeak my spark bird. My spark bird was the Rose-breasted Grosbeak. After seeing this bird in my yard and at my feeders for the first time I knew I loved birds. I became addicted to seeing more and attracting new birds to my yard. We live in a rural area not too far from a reservoir. The reservoir and the forest attract many birds that I am happy to see visit and pass thru our yard. Most of the birds I see in our yard are the woodland birds. Some migrating birds passing thru my area and yard. Living 23 years in our house, we have planted many pine trees, plants, bushes and flowers. We also have a small pond to attract the birds and wildlife. The reservoir a short walk from our house. It is like having a park right outside our door. Above are some of the birds that I see in my yard and around the watershed area of the reservoir.The Barred Owl is often heard and seen during my walks along the fireroads in the nearby woods. The Scarlet Tanager, Ovenbirds, Northern Parulas are just some of the breeders in the woods next to my house. The Great-Crested Flycatcher was seen in my yard and I have seen it taking some of my dogs hair I leave out for its nest. The Northern Parula another breeder in the woods near my house. This Northern Parula was seen in my yard. I look forward to doing a post for Birding is Fun once a month and I hope you like my birds as much as I do. Thanks and happy birding. I have been following Birding is Fun and some of the contributors blogs for some time now. I feel honored to be included with such a great group of birders and photographers. Your birds are great!! Look forward to more posts by you. Great post and great to see you posting here Eileen. Beautiful post Eileen! Your spark bird photos are beautiful! The area around your home is full of life and beautiful. What a blessing to live so close to the reservoir too! Enjoyed your first post here! awesome job, eileen! congrats to you! 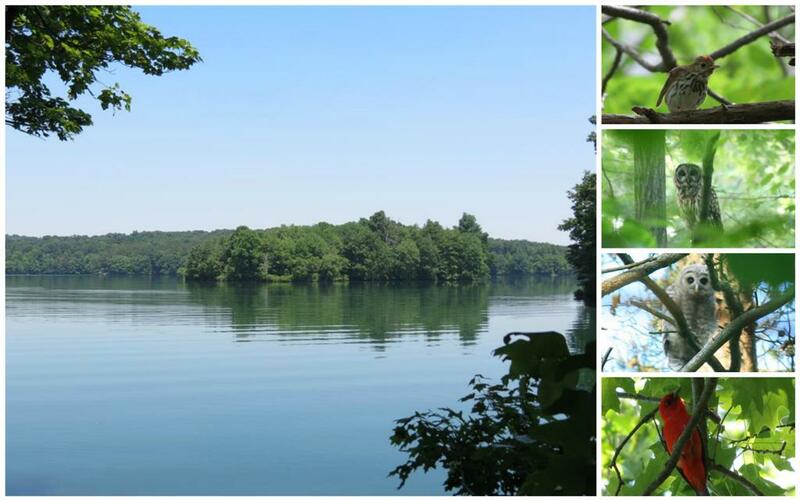 you live in a wonderful birding zone! Wonderful Eileen! Welcome to the team :-) so glad you're presenting The birds from your area! As always you have great birds! Some nice pictures there. I'd lov to see OR hear a barred owl. Eileen, well done and welcome! It's nice to have you here! A rose-breasted grosbeak is an excellent spark bird! Gosh, you really live in a beautiful area just FILLED with beautiful birds. I love watching the birds as well but sadly, I'm not an expert at identifying them at all but you have taught me a few things. I can't wait to see more... good job! Cool post Eileen!! And the first photo is my favourite bird! Wow, amazing pictures! everyone looking cool and calm. really, your account is presenting that you do love the birds. I didn't know about this blog!! !I'll put it on my bloglist!!! Great post!! !Amazing photos!! !You know how much i love birds and your posts! !I'll be back!! Have a lovely week!! !Good luck!!! Super - and such great shots. What a glorious area to live in. You're a natural! I enjoyed your dialog, photos and your local area.....made me want to move - almost. I followed you over here --thanks for the link at your 'other place'... this spot was just made for you -- you will be a perfect contributor! I have enjoyed your blog for years and the beautiful birds you have posted here. Love your blog...love your pics wherever they are! Eileen, your great blog deserves a wider readership and will find it here. Congrats! Congratulations on your first post here, Eileen! Thanx to you, it's also my first visit - but that might just change!!! Especially if you keep including my favourite - the Scarlet Tanager that we just don't have down here in Australia!! Thanks, everyone for the nice comments and for following me to Birding is fun! Nice, beautiful birds from your areas; I like your photomontages. Welcome to Birding is Fun, Eileen! 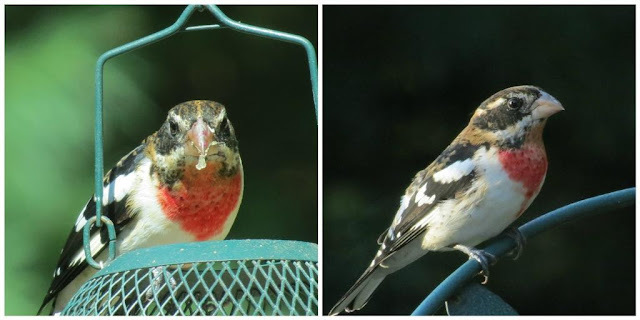 I can see why the Rose-breasted Grosbeak was your spark bird! It's a beauty! Welcome Eileen! You sure live in a great area for viewing birds. So glad to see you are a contributor to The Birding is Fun Blog, as I have always enjoyed visiting your Viewing Nature with Eileen posts. Gorgeous birds, wonderful photographs!